Disclaimer 1: Please note that this page and it's author is not in anyway connected with Apple Computer. This page is not endorsed by Apple Computer. Neither the Author nor Apple Computer take any responsibility for actions resulting from use of advice or software made available on this page. Hello and welcome. In 1997 i was lucky enough to be given my very own Apple Network Server 500/132 to play with. Unfortunately i was given zero documentation, just the server, a power cable, the keys, and the AIX 4.1.4 CD. 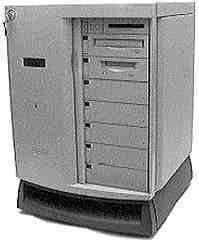 The Apple Network Server (codenamed "Shiner") was introduced in February 1996 and discontinued almost immediately. This was unfortunate because it was an excellent machine but fortunate for me as it meant that i got one free! The machines were discontinued for the reason that they weren't selling, and they didn't sell (in my humble opinion) becuase they were only really advertised to Mac Users, and many mac users are scared of command lines, after all that's the reason that most bought macs in the first place. The machines shipped with AIX 4.1.4 and from what i can tell this can be upgraded all the way up to .... AIX 4.1.5. After that I believe that IBM dropped support. To make matters worse Apple Network Servers have ROMS programmed specifically not to run MacOS, even though there is no real reason why they shouldn't. The only slightly non standard thing about them was their fast wide scsi chipset (Symbios Logic - Formerly NCR - 53c825a) which had previously never been used by Apple in any hardware. Rumor had it that any of the Apple Network Servers can be made to run MacOS by installing a ROM SIMM from a powermac 9500. The 9500 is the most similar mac to the Apple Network Server however the device trees still have many differences. I have had several people try differing ROMS in their Apple Network Servers with varying results. From what i can gather an ans with said rom swap will boot to a certain extent but since the video is different from the 9500 it dies at that point. I have had other reports that fitting the ati card from the 9500 will then add video to the ans but only the external scsi is supported. This really removes the motivation from running mac os on the ans. My advice would be to wait for the Linux PPC port of Sheep Shaver, the excellent mac os emulator. After cursing at AIX a lot i decided to install linux ppc on my box. This was extremely difficult as at the time nobody else had made public any instructions or how to do such a thing though the linux ppc faqomatic claimed it could be done. I pressed on recompiling endless kernels on my 8600, pestering everyone i could for information, but i simply could not crack the scsi side of things. I gave up and the ans became a coffee table until July 1998 when Nick Sklavounakis and Fred Gildred let the world know that they had cracked it and posted their rather crude instructions on how to do so on the linux ppc web site. I did not finally manage to recreate the installation until late 1998 after Aaron deMello posted clearer instructions for more stupid people like myself. Steven Milos steven@equonics.co.jp is decommissioning a number of ANS servers. Indeed this server now has it's RAM maxed out and a few extra drive connectors thanks to him. He has more. If you are interested in a list please email him. I've also done some overdue housekeeping on this site, removing broken links etc. My Ans is now running with even more juice. I found a person on eBay who has a stock of over 30 sets of 200Mhz Upgrade Cards for the Apple Network Server available. He was willing to sell the card at $50, a lot cheaper than the competition, I paid $30.80 to get it shipped to the UK and it's now humming along beautifully. If you want to track him down his email address used to be garka@mediaone.net, but he is moving very soon so if that address turns up nothing just ask www.ebay.com's online search engine for the current address for the user garka. I have also fitted a 1 Megabyte Level 2 Cache which i originally bought for my faithful old 8600. This too works like a dream. New documents online today include the Hardware developers documentation , The NS Theory of Operations from the Apple Service Source, and information on updating to AIX 4.1.5 (This is the most common question that arrives in my email). Since there is little or no information on such machines available on the net i shall post what little i have managed to compile. Disclaimer 2: many of these files have been posted anonymously to newsgroups as a response to my cries for help. I am unsure of the legality of the apple documents, if you work for apple and have a problem with any of these files then please let me know and i will remove the offending items immediately. Apple's Manual on setting up the Network Server. 2.6MB pdf file. Installation, use and administration. 1.9MB pdf file. Installing the card and configuring and administering disk arrays. 1.2MB pdf file. Mirror of Apple's web page on troubleshooting the apple network server. HTML with images. Mirror of Apple's Web page on which AIX binaries will work on ANS AIX. HTML with images. Info on Updating AIX to 4.1.5, note this is designed for people who ordered the CD update to AIX 4.1.5 from Apple. 21K pdf file. For those of you not luck enough to have the CD from Apple, here are Apple's recommended sites for getting updates to AIX on line. 22K pdf file. Boot floppy image for the Network Server, carrys out basic tests on hardware. You can read the Read Me file here. Apple Disk Copy Image stuffed (stuffit version 5) and MacBinary Encoded 195k file. This is a guide to servicing and upgrading Apple Network Servers. Note:this is a very large (9.7MB) pdf file. This document describes the chain of events that occurs when a Network Server is powered on. It is designed to help you better diagnose server failures to boot. 98K pdf file. Guide to development (mostly under AIX) on Apple Network Servers. 568K pdf file. Guide to developing hardware on Apple Network Servers. Also includes a memory map for the various components of the ANS series, including the lcd display, very useful. 848K pdf file. Not really a resource, but worth a look anyway. This is one of apple's original adverts for the ANS. 280K gif file. This is titled Understanding PCI Expansion ROM Choices for Copland and is the first technote to document the open firmware found in Apple Network Servers. 144K pdf file. Fundamentals of Open Firmware, Part I: The User Interface 204K pdf file. Fundamentals of Open Firmware, Part II: The Device Tree 160K pdf file. MacOS is a trademark of Apple Computer. AIX and PowerPC are trademarks of IBM. All other trademarks are the property of their respective owners.